Premium diesel performance. Maximum comfort and productivity. Legendary durability. For a variety of reasons, the redesigned diesel-powered Lazer Z mowers may be the right choice for your cutting needs. They make quick work of the largest, toughest jobs and raise the bar for cut quality, operator comfort, fuel efficiency and ease of handling. Our large 96-inch flex wing deck is capable of mowing over 9.5-acres per hour, making it the most productive mower Exmark has ever built. Improved Handling: The engine and radiator have been placed lower to the ground in the redesigned Lazer Z Diesel. This provides an even lower center of gravity leading to improved traction and a smoother ride. Reduced Maintenance and Service: With an efficient and robust powertrain system, in addition to eliminating drive belts, these machines have less maintenance and longer service intervals. And the tool-less belt access and removable floor pan makes servicing easy. Hydraulic Deck Lift: Standard on all diesel units, the hydraulic deck lift provides for easy cutting height adjustment and quick transport. Fuel Capacity: For longer work intervals, the Lazer Z Diesel has a 12.0-gallon capacity with two tanks. This will keep you mowing longer with fewer fill-ups. Tire Size / Ground Speed: The 26" x 12"-12" drive tires allow you to reach speeds up to 12.5 mph on machines equipped with the 1.6 Liter Common Rail engine. The large drive tires also provide superior traction and handling, giving you the ability to manage diverse terrain and conditions. 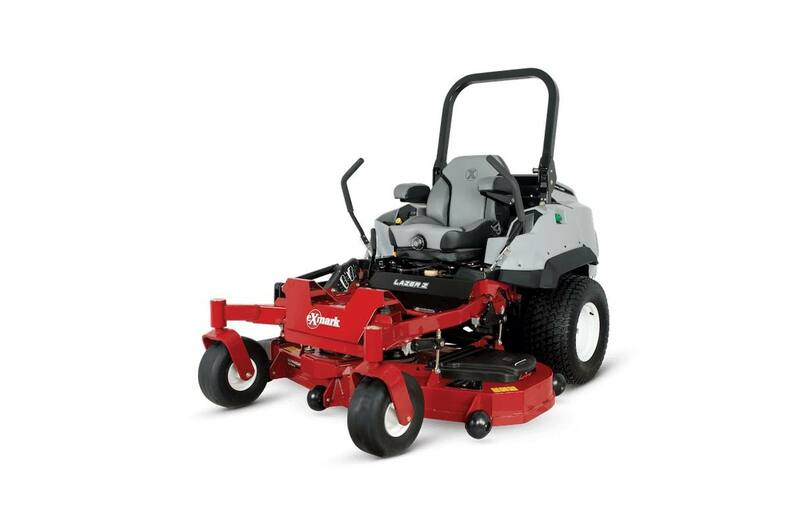 Productivity: The robust engine power and large deck sizes make these mowers Exmark's most productive diesel machines ever. They are a great solution for universities, municipalities and other sizeable properties. On-Board Intelligence: The next generation RED leverages the latest technologies to deliver increased machine efficiency, ease of use and durability. 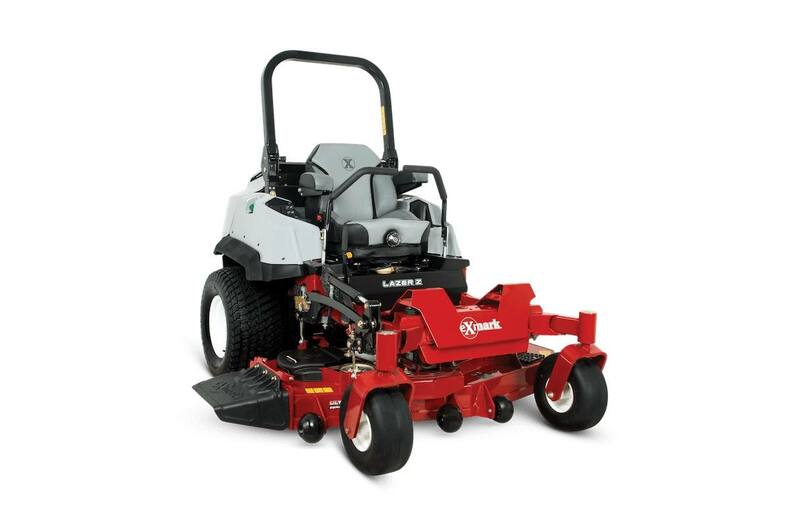 This technology provides users an increased ability to control mower power and efficiency with defined performance modes. Leading Zero-Turn. Strong Warranty. 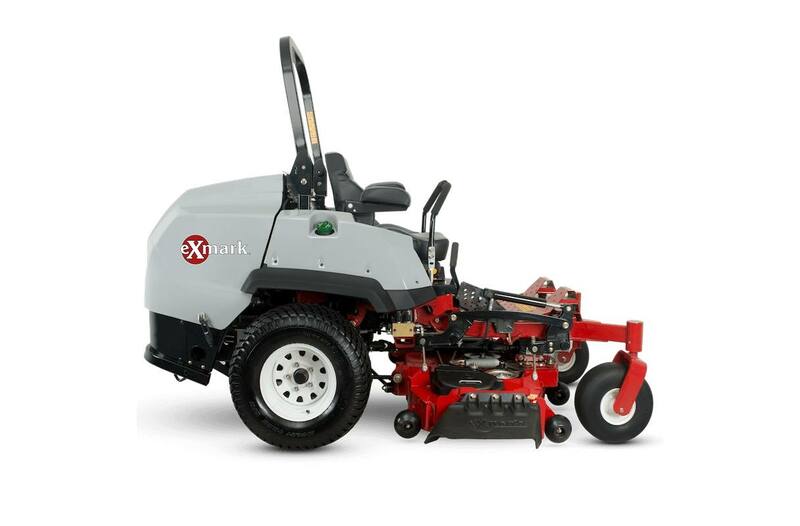 : Purchase an Exmark Lazer Z Diesel mower with confidence by taking advantage of the protection Exmark provides for you with our five year limited warranty. Now standard on all Exmark Lazer Z Diesel mowers sold in the U.S. or Canada. For complete details, visit your local dealer. Tractor Frame: Welded, heavy-duty 1.5" x 3" x 3/16" tubular steel. Steering Control: Hydraulically dampened twin levers, adjust fore and aft., also adjustable to 2 height positions. Adjustable dampeners (3 positions) to customize drive responsiveness. Front Caster Tires: 15 x 6.0-6, smooth-tread, semi-pneumatic. Parking Brake: Lever-actuated internal wet disc brake. Electrical: 12-volt battery with 55-amp alternator. Drive Description: Kanzaki KPS-18T Transmission, 15-quart oil capacity, spin-on filter. 18 cc shoe type pumps and 17.84 cubic inch Hydro-Gear HGM-H motors, hydraulic oil cooler. Speed: Infinitely variable speed selection from 0-12.5 mph (20 kmph) forward, 0-7 mph (11 kmph) reverse.